Every year, hundreds lose their lives and thousands are injured from boating accidents that are preventable. 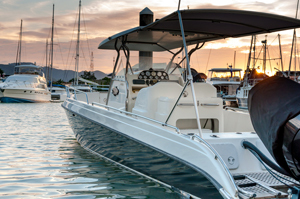 Because errors account for 70 percent of boating accidents, it’s important that everyone on board knows and understands these boat safety tips. First, boat operators must be familiar with boating terminology. This is important for communicating to passengers on the boat, other boat operators and emergency personnel. For example, the bow is the forward part of the boat; the stern, or the aft, is the rear portion; starboard is, looking toward the bow, the right side of the boat; and port is, looking toward the bow, the left side of the boat. These are the directions used when describing accidents. The boat operator and all passengers should wear life jackets. The U.S. Coast Guard estimates that life jackets could have saved the lives of more than 80 percent of boating fatality victims. Oftentimes, accidents occur quickly without time to reach for a jacket, so ensure that everyone puts on a life jacket before entering the boat. In Pennsylvania, all boats must have a U.S. Coast Guard approved, wearable life jacket for each person on board that is in good condition, the appropriate size for each person and easily accessible. All children 12 and younger MUST wear a life jacket while underway on any boat 20 feet in length or less and on all canoes and kayaks. All persons on a boat MUST wear a life jacket from Nov. 1 to April 30. If a small, open boat would capsize, it’s important that someone takes a head count, checks for injury and then everyone stays with the boat. If possible the boat should be turned upright and then paddled to shore. To prevent falls overboard, don’t overload a boat with too much weight and keep your weight close to the centerline. Wear deck-gripping shoes (no bare feet!) and avoid rough water and weather conditions whenever possible.